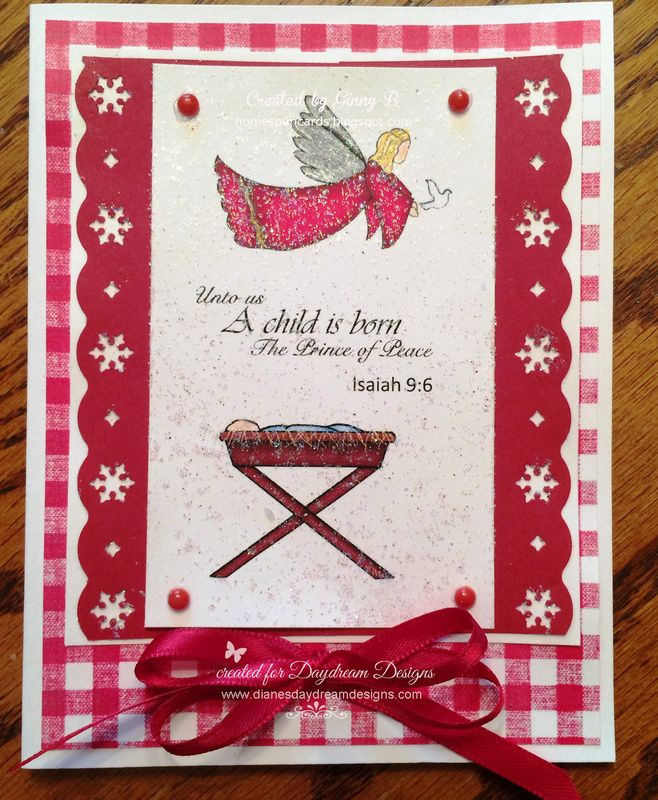 Today's card is using images, a sentiment and paper from Diane's Daydream Designs. When a digi is pre-colored, that is a huge blessing for me, because #1 I really don't enjoy coloring images, and #2 She does them so beautifully, that I could never make them look that good! Thank you for stopping by my blog. I always appreciate your visits. I pray for God's highest and best to you today and every day, and that you would prosper and live at God's highest level for your life. So gorgeous!! I would love to receive this card in the mail!! I love it. Thanks for joining us at Through the Craft Room Door and hope to see you next week as well! You are such a great card maker. Diane, as you so sweetly put it, surely does a great job with her art. You have tied the sweetest bow ever. Thank you so much for joining our 150th challenge at Word Art Wednesday. I thank God for your participation and I pray you will have a day filled with joy. Thanks for joining us at Christmas Card Challenges this week! What a sweet card! Love the sentiment and the adorable image. I've never tried using a precolored image, but this one looks fabulous. Thanks for playing with CHNCC2. Very pretty card. Thanks for joining us this week at Christmas Card Challenges. Very pretty card. Thank you for joining 613 Ave Create challenge this week. Good Luck! this is sooo pretty!!! LOVE everything!!! Thanks for joining us at Christmas card Challenges this week! Make Your Cricut Mat Sticky Again! Winner at 613 Avenue Create! 1. Do your actions and attitudes bring dignity and significance to others? 2. Do your actions and attitudes provide others with purpose, hope and a powerful positive future? 3. Do your actions and attitudes bring individuality to others? Do they allow others to be creative individuals? 4. Do your actions and attitudes give others a sense of safety and protection? 5. Do your actions and attitudes cover others' mistakes releasing them from sin through forgiveness and restoration? The Best Book I've Read in Years! The best book I have ever read on spiritual warfare is Why We Fight by Terry Bennett. This is not a book for namby-pamby half-hearted Christians, but for those seeking a true, intimate relationship with Christ. You can download a free copy of his book at http://terrybennett.net/why-we-fight/. Scroll down the page and on the lower left there is are links for .pdf, Kindle or Other Readers. This book will help prepare you for the intense times that are coming.